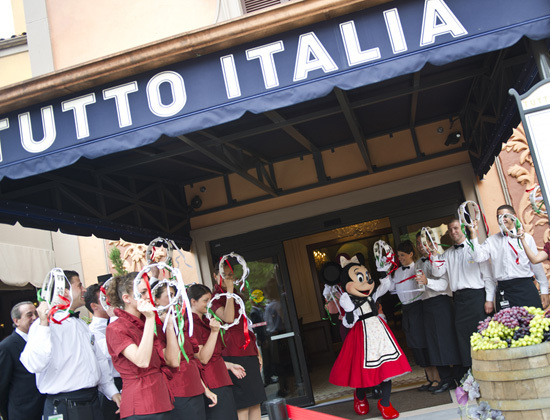 Disney Parks Blog shared several photos from the grand reopening of Tutto Italia. Who was there to celebrate? Mickey and Minnie of course! Chef Joachim Splichal, founder of Patina Restaurant Group; Erin Youngs, vice president of Epcot; and Nick Valenti, CEO of Patina Restaurant Group were all on hand to do the ribbon cutting ceremony. Guest had the chance to take a first look at the new Tutto Gusto! Hopefully I'll be reporting on these changes sooner than later. Check back for a future review of both Tutto Italia and Tutto Gusto.